What Does Mobile Mean For Healthcare And Fitness? What Does Mobile Mean For Fitness? The latest trends in mobile apps for fitness and healthcare are heading toward an exciting destination. Mobile devices are everywhere, and it’s amazing what you see when you observe at any gathering of human beings these days. Half or more of any group seem more involved with the devices in their hands than the world around them. So, what are the ramifications of this behavior for fitness centers and health clubs? As a gym business owner, you always need to look to the future to replace members that drop out or never turn up. Of course, you should work to maximize your retention rate but do you need to seek out new prospects as well. The Millennial generation is a growing segment of the fitness market, and you should consider how you would promote your services to them. The one common feature of the vast majority of the millennial generation is that they own smartphones. If you want to connect and recruit them as members, you need to use the right channels to get a response from them, and that means you should include mobile in your marketing strategy. It turns out that there are some positive aspects to mobile applications and the way our devices have become the center of our lives. Millennials who’ve grown up immersed in technology are the ones who get the most benefits, and they are beginning to use mobile for healthcare too. While they already use mobile fitness applications, Millennials are starting to integrate mobile health or mHealth into their lives as well. Medical organizations promote mHealth apps and services because they provide unified and deep channels for patient data. Some projections of the mHealth market suggest that it will approach or exceed $50 billion per year by 2020, while other, more recent mHealth studies predict that the size of the market will be even larger. The fitness industry will likely be drawn into this trend toward digital health engagement because the boundaries between the two markets are flexible. However, there could be other, more profound implications such as whether you exercise more or less because of your distractions versus your information as a motivator. How Do You Do Mobile As A Small Gym Business? OK, so you decide that mobile in the gym is a good thing you then have two options. First, you provide access to a branded mobile app for your membership. Alternatively, you might choose to sign up to a platform-as-a-service that provides a white label gym app. With such a rapidly growing market, you can expect the unexpected. In the meantime, you might decide to use the resources at your disposal. You can always add more features, and since your Millennial-centric membership is comfortable with digital-culture, out of all your members, they are most likely to respond to gamification. So why not get connected with mobile focused-members and apply a little operant conditioning? Provide some simple form of positive reward to members who engage with your brand. Reward members for connecting – Give members exclusive discounts and offers when they sign up to receive your email newsletter, get alerts, or join your group on any chosen social media platform. Reward members for sharing – It might just be a simple acknowledgment of their comments or a retweet. Any mention or social share makes a difference to your marketing efforts. I like the idea of social media vending machines because you can measure the cost of marketing related activities. As members post hash-tagged messages the machine dispenses one item, say a branded T-shirt, water bottle, or a snack in return. Your fitness focused digital channels come with a lot of uncertainty. However, that means they hold the potential to participate in future innovations at least as much as they contain the risks of failure. The one greatest barrier between information platforms in fitness and health is the onerous reporting and data security requirements under HIPAA and any mHealth legislation that comes along. Even so, health and fitness clubs are going to have to respond to a generation that experiences their world, health, and fitness through the screens of smartphones. There will always be room to develop at the boundary between health and fitness. 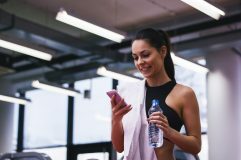 As a small gym business owner, you can take action today to ensure that your fitness club will be better positioned to grow with mobile technology as further mHealth innovations roll out. Cassidy, Ian. What a Generation Ruled by Mobile Means for Healthcare. August 22, 2017. https://www.achieveinternet.com/enterprise-drupal-blogs/mobile-and-future-healthcare (accessed September 3, 2017). —. Small Gym Business Owners Get The Best of Both Worlds With Automation. November 8, 2016. https://blog.gyminsight.com/4053-small-gym-business-owners-get-the-best-of-both-worlds-with-automation/ (accessed May 22, 2017). McCaskill, Ryan. Global mHealth Market to Reach $49.12B by 2020. March 10, 2015. https://mhealthintelligence.com/news/global-mhealth-market-to-reach-42.12b-by-2020 (accessed September 3, 2017).